The Apple IIGS (styled as IIGS), the fifth and most powerful of the Apple II family, is a 16-bit personal computer produced by Apple Computer, Inc. While featuring the Macintosh look and feel, and resolution and color similar to the Commodore Amiga and Atari ST, it remains compatible with earlier Apple II models. The "GS" in the name stands for "Graphics and Sound," referring to its enhanced multimedia hardware, especially its state of the art audio. The microcomputer is a radical departure from any previous Apple II, with its 65C816 16-bit microprocessor, direct access to megabytes of RAM, and mouse. It was the first computer produced by Apple to use a color graphical user interface (color was introduced on the Macintosh II six months later) and Apple Desktop Bus interface for keyboards, mice, and other input devices. It is the first personal computer to have a wavetable synthesis chip, utilizing technology from Ensoniq. The IIGS set forth a promising future and evolutionary advancement of the Apple II line, but Apple increasingly focused on the Macintosh platform. The IIGS clock speed was intentionally limited below the maximum for the 65C816 so the system would not outperform the Macintosh. The IIGS outsold all other Apple products, including the Macintosh, during its first year in production. Apple ceased IIGS production in December 1992. The Apple IIGS made significant improvements over previous machines from the line such as the Apple IIe and Apple IIc. It emulates its predecessors by utilizing a custom chip called the Mega II and used the new Western Design Center 65C816 16-bit microprocessor running at 2.8 MHz, which is faster than the 8-bit NMOS 6502 and CMOS 65C02 processors used in the earlier Apple II models. Use of the 65C816 allows the IIGS to address considerably more RAM. The use of a 2.8 MHz clock was a marketing decision intended to limit the IIGS's performance to a level lower than that of the Macintosh, a decision that had a critical effect on the IIGS's success; the 65C816 processor is capable of running at a much higher clock rate. The IIGS also includes enhanced graphics and sound, which led to its GS name. Its graphical capabilities are the best of the Apple II series, with new higher resolution video modes. These include a 640×200-pixel mode with 2-bit color and a 320×200-pixel mode with 4-bit color, both of which can select 4 or 16 colors (respectively) at a time from a palette of 4,096 colors. By changing the palette on each scanline, it is possible to display up to 256 colors or more per screen, which was quite commonly seen within games and graphic design software during this computer's heyday. Through some clever programming, it is possible to make the IIGS display as many as 3,200 colors at once. When first introduced, Apple's user interface known as MouseDesk and the IIGS System Demo were both in black and white only. Users did not see color until an application which took advantage of the new features was launched. Audio is generated by a built-in sound-and-music synthesizer in the form of the Ensoniq 5503 digital oscillator chip, which has its own dedicated RAM and 32 separate channels of sound. These channels are paired to produce 15 voices in stereo audio. Although Apple had hoped that the IIc would outsell the IIe, the latter was more popular because of its slots. The IIGS supports both 5.25-inch and 3.5-inch floppy disks and, like the IIe before it, has several expansion slots. These include seven general-purpose expansion slots compatible with those on the Apple II, II+, and IIe, plus a memory expansion slot that can be used to add up to 8 MB of RAM. The IIGS, like the IIc, also has dedicated ports for external devices. These include a port to attach even more floppy disk drives, two serial ports for devices such as printers and modems (which can also be used to connect to a LocalTalk network), an Apple Desktop Bus port to connect the keyboard and mouse, and composite and RGB video ports. These ports are associated with the slots, so for example using a card in slot 1 means that the printer port is disabled. The machine also features a user-adjustable control panel and real-time clock, which are maintained by a built-in battery (a non-replaceable 3.6-volt lithium battery; removable in a later revision motherboard). The IIGS also supports booting from an AppleShare server, via the AppleTalk protocol, over LocalTalk cabling. When the Apple IIe Workstation Card was introduced, this capability was given to the IIe. This was over a decade before NetBoot offered the same capability to computers running Mac OS 8 and beyond. In addition to supporting all graphics modes of previous Apple II models, the Apple IIGS introduced several new ones through a custom video graphics chip (VGC), all of which use a 12-bit palette for a total of 4,096 possible colors, though not all colors can appear onscreen at the same time. 320×200 pixels with a single palette of 16 colors. 320×200 pixels with up to 16 palettes of 16 colors. In this mode, the VGC holds 16 separate palettes of 16 colors in its own memory. Each of the 200 scan lines can be assigned any one of these palettes allowing for up to 256 colors on the screen at once. 320×200 pixels with up to 200 palettes of 16 colors. In this mode, the CPU assists the VGC in swapping palettes into and out of the video memory so that each scan line can have its own palette of 16 colors allowing for up to 3,200 colors on the screen at once. 320×200 pixels with 15 colors per palette, plus a fill-mode color. In this mode, color 0 in the palette is replaced by the last non-zero color pixel displayed on the scan line (to the left), allowing fast solid-fill graphics (drawn with only the outlines). 640×200 pixels with 4 pure colors. 640×200 pixels with up to 16 palettes of 4 pure colors. In this mode, the VGC holds 16 separate palettes of 4 pure colors in its own memory. Each of the 200 scan lines can be assigned any one of these palettes allowing for up to 64 colors on the screen at once. 640×200 pixels with 16 dithered colors. In this mode, two palettes of four pure colors each are used in alternating columns. The hardware then dithers the colors of adjacent pixels to create 16 total colors on the screen. Each scan line on the screen can independently select either 320- or 640-line mode, fill mode (320-mode only), and any of the 16 palettes, allowing graphics modes to be mixed on the screen. This is most often seen in graphics programs where the menu bar is constantly in 640-pixel resolution and the working area's mode can be changed depending on the user's needs. The Apple IIGS's sound is provided by an Ensoniq 5503 DOC wavetable synthesis chip designed by Bob Yannes, creator of the SID synthesizer chip used in the Commodore 64. The ES5503 DOC is the same chip used in Ensoniq Mirage and Ensoniq ESQ-1 professional-grade synthesizers. The chip allows for 32 separate channels of sound, though most software pairs them into 16 stereo voices, as do most of the standard tools of the operating system (the MIDISynth Tool Set groups four channels per voice, for a limit of seven-voice audio). The IIGS is often referred to as a 15-voice system, because one stereo voice is reserved by the OS at all times for timing and system sounds. Software that does not use the OS, or uses custom-programmed tools (most games and demos do this), can access the chip directly and take advantage of all 32 voices. The computer's audio capabilities were given as the primary reason for record label Apple Corps's 1989 resumption of legal action against Apple that had been previously suspended. Apple Corps claimed that the IIGS's audio chip violated terms of the 1981 settlement with the company that prohibited Apple, Inc. from getting involved in the music business. A standard ​1⁄8-inch headphone jack is provided on the back of the case, and standard stereo computer speakers can be attached there. However, this jack provides only mono sound, and a third-party adapter card is required for stereo, despite the fact that the Ensoniq and virtually all native software produces stereo audio (stereo audio is essentially built into the machine, but has to be de-multiplexed by third-party cards). Applied Engineering's SonicBlaster is one of a few developed cards for this purpose. Like the Apple II machines before it, the IIGS is highly expandable. The expansion slots can be used for a variety of purposes, greatly increasing the computer's capabilities. SCSI host adapters can be used to connect external SCSI devices such as hard drives and a CD-ROM drive. Other mass-storage devices such as adapters supporting more recent internal 2.5-inch IDE hard drives can also be used. Another common class of Apple IIGS expansion cards is accelerator cards, such as Applied Engineering's TransWarp GS, replacing the computer's original processor with a faster one. Applied Engineering developed the PC Transporter, which is essentially an IBM-PC/XT on a card. A variety of other cards were also produced, including ones allowing new technologies such as 10BASE-T Ethernet and CompactFlash cards to be used on the IIGS. Steve Wozniak said in January 1985 that Apple was investigating the 65816, and that an 8MHz version would "beat the pants off a 68000 in most applications", but any product using it would have to be compatible with the Apple II. Rumors spread about his work on an "Apple IIx". The IIx was said to have a 16-bit CPU, one megabyte of RAM, and better graphics and sound. "IIx" was the code name for Apple's first internal project to develop a next-generation Apple II based on the 65816. The IIx project, though, became bogged down when it attempted to include various coprocessors allowing it to emulate other computer systems. Early samples of the 65816 were also problematic. These problems led to the cancellation of the IIx project, but later, a new project was formed to produce an updated Apple II. This project, which led to the released IIGS, was known by various codenames while the new system was being developed, including "Phoenix", "Rambo", "Gumby", and "Cortland". There were rumors of several vastly enhanced prototypes built over the years at Apple but none were ever released. Only one, the "Mark Twain", has been revealed so far. The Mark Twain prototype (named for Twain's famous quote "The reports of my death are greatly exaggerated") was expected to have the "ROM 04" revision (although prototypes that have been discovered do not contain any new ROM code)  and featured an 8 MHz 65C816, built-in SuperDrive, 2 MB RAM, and a hard drive. Some design features from the unsuccessful Apple III lived on in the Apple IIGS, such as GS/OS borrowing elements from SOS (including, by way of ProDOS, the SOS file system), a unique keyboard feature for dual-speed arrow keys, and colorized ASCII text. During its introduction, Apple sold a specialized set of Bose Roommate speakers that were platinum-colored with the Apple logo next to the Bose on each front speaker grille. An easter egg (activated by Command-Option-Control-N) in ROM 3 lists the members of development team, and plays an audio clip of them shouting "Apple II!". As part of a commemorative celebration marking the 10th anniversary of the Apple II series' development, as well as Apple Computer itself celebrating the same anniversary, a special limited edition was introduced at product launch. The first 50,000 Apple IIGSs manufactured had a reproduced copy of Wozniak's signature ("Woz") at the front right corner of the case, with a dotted line and the phrase "Limited Edition" printed just below it. Owners of the Limited Edition, after mailing in their Apple registration card, were mailed back a certificate of authenticity signed by Wozniak and 12 key Apple engineers, as well as a personal letter from Wozniak himself (both machine-reproduced). Because the difference between standard and Limited Edition machines were purely cosmetic, many owners of new were able to "convert" to the Limited Edition by merely swapping the case lid from an older (and likely nonfunctional) machine. While of nostalgic value to Apple II users and collectors, presently these stamped-lid cases are not considered rare, nor do they have any particular monetary worth. The Apple Desktop Bus, which for a long time was the standard for most input peripherals for the Macintosh, first appeared on the IIGS. In addition, the other standardized ports and addition of SCSI set a benchmark which allowed, for the first time, Apple to consolidate their peripheral offerings across both the Apple II and Macintosh product lines, permitting one device to be compatible with multiple, disparate computers. The IIGS is also the first Apple product to bear the new brand-unifying color scheme, a warm gray color Apple dubbed "Platinum". This color would remain the Apple standard used on the vast majority of all products for the next decade. The IIGS is also the second major computer design after the Apple IIc by Apple's outsourced industrial designer Frogdesign and together with its new corporate color and matching peripherals, officially ushered in the Snow White design language which was used exclusively for the next five years and made the Apple product line instantly recognizable around the world. The inclusion of a professional-grade sound chip in the Apple IIGS was hailed by both developers and users, and hopes were high that it would be added to the Macintosh; however, it drew a lawsuit from Apple Records. As part of an earlier trademark dispute with the record company, Apple Computer had agreed not to release music-related products. Apple Records considered the inclusion of the Ensoniq chip in the IIGS a violation of that agreement. Upon its release in September 1986, Apple announced it would be making a kit that would upgrade an Apple IIe to a IIGS available for purchase. This followed an Apple practice of making logic board upgrades available that dated from the earliest days of the Apple II until Steve Jobs' return to Apple in 1997. The IIe-to-IIGS upgrade replaced the IIe motherboard with a 16-bit IIGS motherboard. Users would take their Apple IIe machines into an authorized Apple dealership, where the IIe motherboard and lower baseboard of the case were swapped for an Apple IIGS motherboard with a new baseboard (with matching cut-outs for the new built-in ports). New metal sticker ID badges replaced those on the front of the IIe, rebranding the machine. Retained were the upper half of the IIe case, the keyboard, speaker and power supply. Original IIGS motherboards (those produced between 1986 and mid-1989) have electrical connections for the IIe power supply and keyboard present, although only about half of those produced have the physical plug connectors factory-presoldered in, which were mostly reserved for the upgrade kits. The upgrade cost US$500, plus the trade-in of the user's existing Apple IIe motherboard. It did not include a mouse, and the keyboard, although functional, lacked a numeric keypad and did not mimic all the features and functions of the Apple Desktop Bus keyboard. Some cards designed for the GS did not fit in the Apple IIe's slanted case. In the end, most users found that the upgrade did not save them much money once they purchased a 3.5-inch floppy drive, analog RGB monitor, and mouse. Software that runs on the Apple IIGS can be divided into two major categories: 8-bit software compatible with earlier Apple II systems such as the IIe and IIc, and 16-bit IIGS software, which takes advantage of its advanced features, including a near-clone of the Macintosh graphical user interface. Apple claimed that the IIGS was 95% compatible with contemporary Apple II software. One reviewer, for example, successfully ran demo programs that came on cassette with his 1977 Apple II. The IIGS can run all of Apple's earlier Apple II operating systems: Apple DOS, ProDOS 8, and Apple Pascal. It is also compatible with nearly all 8-bit software running on those systems. Like the Apple II+, IIe, and IIc, the IIGS also includes Applesoft BASIC and a machine-language monitor (which can be used for very simple assembly language programming) in ROM, so they can be used even with no operating system loaded from disk. The 8-bit software runs twice as fast unless the user turns down the processor speed in the IIGS control panel. The Apple IIGS System Software utilizes a graphical user interface (GUI) very similar to that of the Macintosh and somewhat like GEM for PCs and the operating systems of contemporary Atari and Amiga computers. Initial versions of the System Software are based on the ProDOS 16 operating system, which is based on the original ProDOS operating system for 8-bit Apple II computers. Although it was modified so that 16-bit Apple IIGS software can run on it, ProDOS 16 was written largely in 8-bit code and does not take full advantage of the IIGS's capabilities. Later System Software versions (starting with version 4.0) replaced ProDOS 16 with a new 16-bit operating system known as GS/OS. It better utilizes the unique capabilities of the IIGS and includes many valuable new features. The IIGS System Software was substantially enhanced and expanded over the years during which it was developed, culminating in its final official version, System 6.0.1, which was released in 1993. In July 2015, members of an American computer club released a new version of that System Software, fixing some bugs. Similar to that of the Macintosh, the IIGS System Software provides a mouse-driven graphical user interface using concepts such as windows, menus, and icons. This was implemented by a "toolbox" of code, some of which resides in the computer's ROM and some of which is loaded from disk. Only one major application can run at a time, although other, smaller programs, known as Desk Accessories, can be used simultaneously. The IIGS has a Finder application very similar to the Macintosh's, which allows the user to manipulate files and launch applications. By default, the Finder is displayed when the computer starts up and whenever the user quits an application that is started from it, although the startup application can be changed by the user. Software companies complained that Apple did not provide technical information and development tools to create IIGS-specific software. In 1988 Compute! reported that both Cinemaware and Intergalactic Development had to write their own tools to maximize their use of IIGS audio, with the latter stating that "these sorts of problems … are becoming well-known throughout the industry". The IIGS System Software can be extended through various mechanisms. New Desk Accessories are small programs ranging from a calculator to simple word processors that can be used while running any standard desktop application. Classic Desk Accessories also serve as small programs available while running other applications, but they use the text screen and can be accessed even from non-desktop applications. Control Panels and initialization files are other mechanisms that allow various functions to be added to the system. Finder Extras permits new capabilities to be added to the Finder, drivers can be used to support new hardware devices, and users can also add "tools" that provide various functions that other programs can utilize easily. These features can be used to provide features that were never planned for by the system's designers, such as a TCP/IP stack known as "Marinetti". A third party UNIX-like multitasking kernel was produced, called GNO/ME, which runs under the GUI and provides preemptive multitasking. In addition, a system called The Manager can be used to make the Finder more like the one on the Macintosh, allowing major software (other than just the "accessory" programs) to run simultaneously through cooperative multitasking. After previewing the computer, BYTE stated in October 1986 that "The Apple IIGS designers' achievements are remarkable, but the burden of the classic Apple II architecture, now as venerable (and outdated) as COBOL and batch processing, may have weighed them down and denied them any technological leaps beyond an exercise in miniaturization." The magazine added that "hog-tied by [classic] Apple II compatibility, [the IIGS] approaches but does not match or exceed current computer capabilities" of the Macintosh, Commodore Amiga, or Atari ST, and predicted that many vendors would "enhance existing products for the [classic] Apple II instead of writing new software" that fully exploited the IIGS's power. inCider, which in September had warned that the next Apple II "needs (at least) ... a megabyte of RAM ... That's what the market wants", indeed reported in November that "Rather than risk investing time and money in programs that work only on the Apple IIGS, a number of software developers have simply upgraded old Apple II programs", and that the "most interesting program available specifically for the IIGS at this time is LearningWays' Explore-a-Story, which was released simultaneously for the good old 128K Apple IIe and IIc". The magazine concluded, "The moral is simple: Good hardware, even innovative hardware, won't give birth to good, new software overnight." Nibble was more positive, calling the price "fantastic" for "Steve Wozniak's dream machine". It praised the IIGS's "incredible" legacy Apple II compatibility, graphics, and sound, stated that only its slower speed made the computer significantly inferior to the Macintosh, and expected that Apple would soon introduce new products to better distinguish the two product lines. The magazine concluded that "The IIGS is an incredibly fine computer, arguably the finest assemblage of chips and resistors ever soldered together ... Ladies and gentlemen of Apple, on behalf of the Apple II user community, you have earned our gratitude and admiration." Compute! described the IIGS in November 1986 as "two machines in one—a product that bridges the gap between the Macintosh and Apple IIe, and in so doing poses what may be serious competition for the Commodore Amiga and the Atari ST series". It described the IIGS's graphics "as different as night and day" from the earlier Apple IIs and the audio as "in a class by themselves ... [it] justifies the price of the IIGS to many music fans and fanatics". The magazine reported that "well over one hundred outside developers were actively engaged in creating software for the IIGS", and predicted that "as new products are developed to take advantage of the IIGS, people will move away from the pure Apple II software and toward the newer titles with their improved performance". Compute! 's Apple Applications in December 1987 reported, however, that "Many publishers have canceled or postponed their plans for Apple IIGS software and instead are cautiously introducing programs for the Apple IIc and IIe", while "many of the products for the Apple IIGS are simply versions of" older Apple II software "that incorporate color and use the mouse interface". So little IIGS software was available, it said, that "the hottest product ... is AppleWorks. No mouse interface, no color, no graphics. 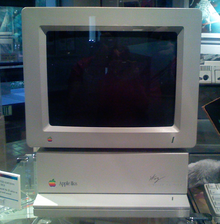 Just AppleWorks from the IIe and IIc world". The magazine stated that many customers either chose the slightly more expensive Macintosh Plus or kept their inexpensive IIc or IIe which ran AppleWorks well, with the IIGS "in a strange position" in between. BYTE's Bruce Webster in January 1987 praised Apple for permitting Wozniak to finish the IIx project, but said that the company should have done so "a few years ago". The IIGS is an excellent replacement for the [earlier models from the] Apple II line, but it's awfully late in coming. The technology is more trailing-edge than leading-edge in many areas", with speed and graphics inferior to that of the Amiga and Atari ST. The other computers, he wrote, have both larger software libraries that use their power and lower prices; Webster found that a IIGS package costing $2500 was comparable to a $1500 Atari ST configuration. He concluded with a "qualified approval" of the computer: "It was necessary to prevent the Apple II line from dying off during the next year or so. However, Apple didn't go far enough." A BYTE review in April 1987 concluded that the IIGS "has the potential to be a powerful computer" but needed a faster CPU and more addressable memory. The magazine advised potential customers to compare the Macintosh, Amiga, and Atari ST's more powerful 68000 CPU with the IIGS's greater expandability and large Apple II software library. Compute! in 1988 urged Apple to make the computer faster, stating that "no matter which way you cut it, the IIGS is slow" and that IIGS-specific programs could not keep up with user actions. In 1989 the magazine stated "One of the biggest complaints of IIGS-specific software is the way it imitates the pace of a zombie. You'd think 16-bit software had died and voodoo-transformed into a shuffling, stumbling imitation of real computer applications." It reported that year that after increases in September, a IIGS with color monitor, two disk drives, and ImageWriter II cost more than $3,000, a price the magazine called "staggering". inCider also criticized the price increase, warning that it "opens the door further to low-cost MS-DOS computers". While in production between September 1986 and December 1992, the Apple IIGS remained relatively unchanged from its inception. During those years, however, Apple did produce some maintenance updates to the system which mainly comprised two new ROM-based updates and a revamped motherboard. It is rumored that several prototypes that greatly enhanced the machine's features and capabilities were designed and even built, though only one has ever been publicly exposed (i.e. the "Mark Twain"). Outlined below are only those revisions and updates officially released by Apple. During the entire first year of the machine's production an early, almost beta-like, firmware version shipped with the machine and was notably bug-ridden. Some limitation of this include the fact that the built-in RAM Disk can't be set larger than 4 MB (even if more RAM is present) and the firmware contains the very early System 1.x toolsets. It became incompatible with most native Apple IIGS software written from late-1987 onward, and OS support only lasted up to System 3. The startup splash screen of the original ROM only displays the words "Apple IIgs" at the top center of the screen, in the same fashion that previous Apple II models identify themselves. Very early production runs of the machine had a faulty video graphics controller (VGC) chip that produced strange cosmetic glitches in emulated (IIe/IIc) video modes. Specifically, the 80-column text display and monochrome double-high-resolution graphics had a symptom where small flickering or static pink bits would appear between the gaps of characters and pixels. Most users noticed this when using AppleWorks classic or the Mousedesk application that was a part of System 1 and 2. Apple resolved the issue by offering a free chip-swap upgrade to affected owners. In August 1987, Apple released an updated ROM that was included in all new machines and was made available as a free upgrade to all existing owners. The main feature of the new ROM was the presence of the System 2.x toolsets and several bug fixes. The upgrade was vital, as software developers, including Apple, ceased support of the original ROM upon its release (most native Apple IIGS software written from late-1987 onwards would not run unless a ROM 01 or higher was present, and this included the GS/OS operating system). This update also allows up to 8 MB for the RAM Disk, added some new features for programmers, and reported the ROM version and copyright information on the startup splash screen. In March 1988, Apple began shipping IIGS units with 512 KB of RAM as standard. This was done by preinstalling the Apple IIGS Memory Expansion Card (that was once sold separately) in the memory expansion slot—the card had 256 KB of RAM on board with empty sockets for further expansion. The built-in memory on the motherboard remained at 256 KB and existing users were not offered this upgrade. In August 1989, Apple increased the standard amount of RAM shipped in the IIGS to 1.125 MB. This time the additional memory was built-in on the motherboard, which required a layout change and allowed for other minor improvements as well. This update introduced both a new motherboard and a new ROM firmware update; however, neither was offered to existing owners—even as an upgrade option (the new ROM, now two chips, is incompatible with the original single-socket motherboard). Apple had cited the reason an upgrade was not being offered was that most of the features of the new machine could be obtained in existing machines by installing System 5 and a fully populated Apple IIGS Memory Expansion Card. The new ROM firmware then took 256 KB and contained the System 5.x toolsets. The newer toolsets increased the performance of the machine by up to 10%, due to the fact that less had to be loaded from disk, tool ROM read access being faster than RAM, and their highly optimized routines compared to the older toolsets (pre-GS/OS-based). In addition to several bug fixes, also added were more programmer assistance commands and features, a cleaned-up control panel with improved mouse control and RAM Disk functionality, more flexible Appletalk support and slot-mapping. In terms of hardware, the new motherboard is a cleaner design that drew less power and resolved audio noise issues that interfered with the Ensoniq synthesizer in the original motherboard. Over four times more RAM is built-in, with double the ROM size, and an enhanced ADB microcontroller provides native support for sticky keys, mouse emulation, and keyboard LED support (available on extended keyboards). Hardware shadowing of Text Page 2 was introduced, improving compatibility and performance with the classic Apple II video mode. The clock battery is now user-serviceable, being placed in a removable socket, and a jumper location was added to lock out the text-based control panel (mainly useful in school environments). Support for the Apple-IIe-to-IIGS upgrade was removed, and some cost-cutting measures had some chips soldered in place rather than being socketed. As the firmware only worked in this motherboard and no new firmware updates were ever issued, users commonly referred to this version of the IIGS as the "ROM 3". Like the Apple IIe and Apple IIc built-in keyboards before it, the detached IIGS keyboard differs depending on what region of the world it was sold in, with extra local language characters and symbols printed on certain keycaps (e.g. French accented characters on the Canadian IIGS keyboard such as "à", "é", "ç", etc., or the British Pound "£" symbol on the UK IIGS keyboard). Unlike previous Apple II models, however, the layout and shape of keys were the same standard for all countries, and the ROMs inside the computer were also the same for all countries, including support for all the different international keyboards. In order to access the local character set layout and display, users would change settings in the built-in software-based control panel, which also provides a method of toggling between 50/60 Hz video screen refresh. The composite video output is NTSC-only on all IIGS systems; users in PAL countries are expected to use an RGB monitor or TVs which featured RGB SCART. This selectable internationalization makes it quick and simple to localize any given machine. Also present in the settings is a QWERTY/DVORAK keyboard toggle for all countries, much like that of the Apple IIc. Outside North America, the Apple IIGS shipped with a different 220 V clip-in power supply, making this and the plastic keycaps the only physical differences (and also very modular, in the sense of converting a non-localized machine to a local one). Apple designed the Apple IIe Card to transit Apple IIe customers to the Macintosh LC, particularly schools who had a large investment in Apple II software. While Apple discussed creating an LC plug-in IIGS card, they felt that the cost of selling it would be as much as an entire LC and abandoned it. However, the educational community had a substantial investment in the IIGS software as well, which made upgrading to a Macintosh a less attractive proposition than had been for the Apple IIe. As a result, Apple software designers Dave Lyons and Andy Nicholas spearheaded a program to develop a IIGS software emulator they called Gus in their spare time, which would run on the Power Macintosh only. Apple did not officially support the project. Nevertheless, seeing the need to help switch their educational customers to the Macintosh (as well as sell Power Macs), Apple unofficially distributed the software for free to schools and other institutions that signed a non-disclosure agreement. It was never offered for public sale, but is now readily available on the internet, along with many third-party classic Apple II emulators. Gus represents one of the few software emulators developed within Apple (officially or otherwise), including MacWorks and Mac OS X Classic environment. John Carmack, co-founder of id Software, started his career by writing commercial software for the Apple IIGS, working with John Romero and Tom Hall. Wolfenstein 3D, based on the 1981 Apple II game Castle Wolfenstein, came full-circle when it was released for the Apple IIGS in 1998. Two mainstream video games, Zany Golf and The Immortal, both designed by Will Harvey, originated as Apple IIGS games that were ported to other platforms, including the Sega Genesis. Pangea Software started as an Apple IIGS game developer. Naughty Dog started with the classic Apple II machines, but later developed for the IIGS. In August 1988, inCider magazine reported Apple was working on a new Apple IIGS. It was stated it had a faster CPU, improved graphics (double the vertical resolution, 256 colors per scanline and 4,096 colors per screen), 768k RAM, 256k ROM, 128K sound DOC-RAM and a built-in SCSI port. No new machine would appear that year. In 1989 Compute! reported on speculation that Apple would announce at the May AppleFest a "IIGS Plus" with a processor two to three times faster, 768KB to 1MB RAM, and a SCSI port. The speculation was partially based on Apple CEO John Sculley stating that the IIGS would receive a new CPU in 1989. No new computer appeared, but in August the IIGS started shipping with 1MB RAM in the base configuration. VTech, makers of the 8-bit Apple II-compatible Laser 128, announced plans for a IIGS-compatible computer in 1988 for under $600. They demonstrated a prototype in 1989, but the computer was never released. Cirtech started work on, but never completed, a black-and-white Macintosh hardware emulation plug-in card for the IIGS dubbed "Duet". Using a 68020 processor, custom ROM and up to 8 MB RAM, Cirtech claimed it would outperform the Macintosh IIcx. ^ Electronic and computer music By Peter Manning. ^ a b Histoire de l'Apple IIGS, "Histoire de l'Apple IIGS"
^ Kavadias, Tony (July 24, 2004). "Apple II User Interfaces". Guidebookgallery.org. Retrieved November 13, 2011. ^ a b c Williams, Gregg; Grehan, Richard (October 1986). "The Apple IIGS". BYTE. p. 84. Retrieved 4 November 2013. ^ a b c Chien, Philip (April 1987). "The Apple IIGS". BYTE. p. 223. Retrieved 5 November 2013. ^ Williams, Gregg; Moore, Rob (January 1985). "The Apple Story / Part 2: More History and the Apple III". BYTE (interview). p. 166. Retrieved October 26, 2013. ^ Pournelle, Jerry (March 1985). "On the Road: Hackercon and COMDEX". BYTE. p. 313. Retrieved 19 March 2016. ^ Statt, Paul (August 1986). "Future II's". inCider. p. 14. Retrieved 10 August 2014. ^ de Peyster, Deborah; Statt, Paul (September 1986). "Extras for the //x". inCider. p. 14. Retrieved 2 July 2014. ^ "The Apple II Guide and Mark Twain". ^ Schwan, Ben (July 20, 2015). "System 6.0.2 für den Apple IIgs erscheint nach 22 Jahren". Heise Online. Retrieved June 8, 2016. ^ Keizer, Gregg (December 1988). "Where's Apple?". Compute!. p. 64. Retrieved 10 November 2013. ^ Statt, Paul (September 1986). "Stattus Report". inCider. p. 110. Retrieved 2 July 2014. ^ Statt, Paul (November 1986). "Visions of GS Software". inCider. p. 46. Retrieved 1 July 2014. ^ Szetela, David (October 1986). "The New II". Nibble. p. 5. Retrieved 18 August 2014. ^ Thornburg, David D. (November 1986). "The New Apple IIGS". Compute!. p. 18. Retrieved 4 July 2014. ^ "II On II". Compute! 's Apple Applications. December 1987. p. 8. Retrieved 18 August 2014. ^ Webster, Bruce (January 1987). "View and Reviews". BYTE. p. 367. Retrieved 30 June 2014. ^ Keizer, Gregg (November 1988). "IIGS Gets Going". Compute!. p. 66. Retrieved 10 November 2013. ^ Keizer, Gregg (March 1989). "Apple II". Compute!. p. 58. Retrieved 10 November 2013. ^ Keizer, Gregg (February 1989). "Stratospheric". Compute!. p. 50. Retrieved 10 November 2013. ^ Muse, Dan (November 1988). "Born Old (But Not Ugly)". inCider. p. 8. Retrieved 1 July 2014. ^ Effectively 140×192 in color, due to pixel placement restrictions. ^ a b Text can be mixed with graphic modes, replacing either bottom 8 or 32 lines of graphics with four lines of text, depending on video mode. Colorized text is unique to the Apple IIGS, all other Apple II models produce text in only black and white. ^ a b c d 16 colors per scanline, palette can be changed on each line. Exceeding 16 palettes per screen drastically limits system resources (e.g. only useful for static images typically). ^ Dithered mode creates the visual illusion of 16 colors by alternated colored pixels in the 4 mini palettes, in addition to taking advantage of the AppleColor RGB's high (0.37 mm) dot pitch. ^ Only 15 voices are available in most software due to firmware pairing oscillators and reserving one for timing. ^ a b While output from audio jack is mono, and all third-party stereo cards only produce two-channel stereo, the capability for supporting 8-channel stereo is present on the motherboard/chip. ^ "apple2history.org, The Apple IIGS, The Beginning of the End". Apple2history.org. September 25, 1991. Retrieved March 27, 2017. ^ "apple2.org.za, Apple II – Rumors, Facts and Fables – Part 2". Apple2.org.za. September 15, 1996. Retrieved November 13, 2011. ^ "kashum.com, Me and the Apple II". Kashum.com. Retrieved November 13, 2011. ^ "apple2history.org, Museum, Screenshots: "Gus Emulator"". Apple2history.org. Retrieved November 13, 2011. ^ "scout.wisc.edu, Run Apple IIGS programs on your Mac". Scout.wisc.edu. April 2, 1997. Retrieved November 13, 2011. ^ "wap.org, Washington Apple Pi's Apple II Page". Wap.org. Retrieved November 13, 2011. ^ "emulation.victoly.com, Apple II, Gus 1.0b4". Web.archive.org. September 29, 2007. Archived from the original on September 29, 2007. Retrieved November 13, 2011. ^ "www.apple2.nu, GenieLamp Apple II Vol.5, Issue 53, MESSAGE SPOTLIGHT: A few words about Gus:". Retrieved November 13, 2011. ^ "The Giant List of Classic Game Programmers". dadgum.com. ^ Keizer, Gregg (February 1989). "Talk, Talk, Talk". Compute!. p. 51. Retrieved 10 November 2013. ^ Keizer, Gregg (July 1989). "Apple II Forever?". Compute!. p. 55. Retrieved 11 November 2013. ^ a b Keizer, Gregg (August 1989). "No IIGS Plus". 1989-08. p. 54. Retrieved 11 November 2013. ^ Ferrell, Keith (April 1988). "Computers Win Big!". Compute!. p. 6. Retrieved 10 November 2013. Wikimedia Commons has media related to Apple IIGS.